Here is a great collection of songs and rhymes that invite beat motions from students in the mid- to late elementary grades. For generations, neighborhood kids would gather to skip rope, bounce balls, play hand clapping games or choose one another to be the first "it" in a game with a counting-out rhyme. The songs and rhymes in this book and the community made by playing these games are a great foundation for music learning. By sharing these songs and rhymes with students during music class, today’s students will discover the joy of music and, hopefully, share the songs, rhymes and games in this collection with their friends and family. 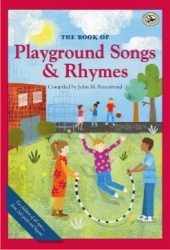 John M. Feierabend has organized these songs and rhymes into five distinct categories: Hand Clapping, Jump Rope, Ball Bouncing, Counting Out and Passing and Stick Games. Each section has numerous songs and rhymes to keep children interested and engaged for years and will be a wonderful resource for music teachers.